Eric Coles and Ethan Gabriel Riordan in Devil and the Deep. Photo by James Wilson. BOTTOM LINE: Not much devil, and not very deep. It is no accident that Robert Louis Stevenson’s classic tale of marauding buccaneers has remained a keystone of popular literature for over a hundred years. Even if one’s young adulthood was bereft of black spots and sea cook insurrections, simply the title Treasure Island carries with it a spirit of adventure and boundless imagination. Suitably, the 19th-century novel stands today as one of the most prolifically dramatized of the genre. A cursory Google search suggests some 70+ adaptations spanning many languages and performance media. 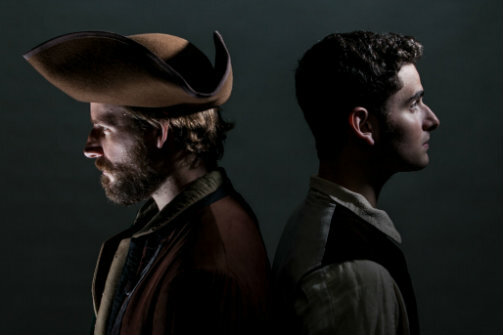 It’s with great ambition, then, that Theatre East (The Soldier Dreams, Eye of God), undertakes a bold musical reimagining of Treasure Island in its latest production, Devil and the Deep. The setting is a promising one. Complimentary pirate-themed cocktails flow freely as the audience filters in. The spare scenery by Alisa Simonel-Keegan and Jim Keegan colors the room unassumingly with sea imagery and billowed sails, inviting an open-concept energy fitting the intrepid charm of young Jim Hawkins' coming-of-age escapade. The company gathers for the opening number, heralding Jim's hopes for grandeur and excitement with an enchanting choral overture buzzing with expectation and the universal wish for the-great-world-out-there. The score, written by Air Supply guitarist Graham Russell, adopts a lilting Celtic tenor, with the simple piano-guitar duo mimicking the syncopations of lopping sea waves. Jim (a boyish Ethan Gabriel Riordan) is left on stage sweeping the floors of the dilapidated Admiral Benbow Inn, the establishment he and his mother (Raissa Katona Bennett) have assumed the responsibility of managing following the recent passing of Jim’s father. As Jim laments his humdrum life on land, a seafaring stranger (played with unsettling severity by Kire Tosevski) arrives, clutching a mysterious chest and requesting lodging. So begins Jim’s great adventure, as a second untimely visitor and an ensuing sword battle leaves Jim in possession of a much sought-after treasure map. Jim sets out to sea aboard the Hispaniola on a secret mission to uncover the treasure, accompanied by a motley cast of sea mates, including Eric Coles’ too-likable Long John Silver and a gender-reversed Mizzy Hands (Lisha McKoy), who learn of the treasure and lead an uprising among the crew to pursue the riches for themselves. The complexities of the plot unfold over the second act of the production, as the mutineers violently jockey to reach the treasure first, and Jim’s life is placed in increasing danger. The musical, however, can’t keep pace with the rising action. Russell’s music, rich with possibility in the opening number, relies too heavily on a limited palate of pirate-y flourishes and fails to carve out a style of its own. The musical moments spring from an apparent need for “another song” rather than a heightened expression of larger-than-life characters, and as a result, Devil and the Deep trips along at an uneven pace with stunted momentum. The production as a whole slips into similar pitfalls, as director Lisa Devine leans on staging tropes demanding greater conceptual investment (a glowing miniature ship figures centrally, but fails to elevate the storytelling in the way Peter and the Starcatcher did with a strikingly similar invention). The script weighs heavy with plot details and pedestrian encounters (an entire early scene is devoted to Jim and Silver in the kitchen exchanging bland truisms about the greatness of gold), thus missing opportunities to engage more expressively with Stevenson’s deeply imaginative landscape. All told, the richness of the original material is satisfying and rises above the shortcomings of the production, and offers a fresh chance to share a timeless story with younger family members. However, the promise of a bold reimagining falls unimaginatively short of the myriad other adaptations and recent seafaring stage productions that have plumbed the deep with much greater creative facility.